June 5, 2017 / Vancouver, BC – NRG Metals Inc. (“NRG” or the “Company”) (TSX-V: NGZ) (OTCQB: NRGMF) (Frankfurt OGPN). ). 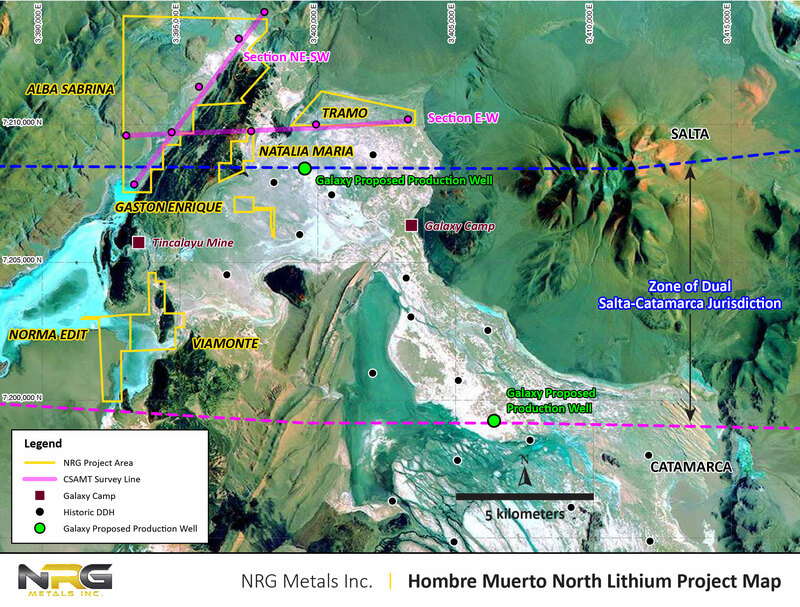 The Company is pleased to announce that it has entered into an option agreement to purchase the Hombre Muerto North Lithium Project, located in Salta and Catamarca Provinces, Argentina. The property package of 3,287 hectares is comprised of the Alba Sabrina, Tramo, Natalia Maria, Gaston Enrique, Viamonte and Norma Edit concessions, all located in the Salar del Hombre Muerto in northwestern Argentina. 20 surface samples collected in 2016-2017 range from 48 to 1,064 mg/L Li, averaging 587 mg/L Li , with seven samples over 800 mg/Li [see sample details in table below]. Magnesium to lithium ratios range from 1.1:1 to 10.2:1, averaging 4.6:1 , which are low by industry standards. Geophysical data indicates zones of low resistivity, interpreted to be potential lithium-bearing zones that are open at depth. Adjacent to Galaxy Resources’ Sal de Vida lithium development project and FMC Corp’s long-time producing Fenix lithium brine operations. The location of the project and the concessions is shown on the map below. The western part of the Salar del Hombre Muerto is host to FMC’s Fenix Mine (~20 km south of the Hombre Muerto North property), which has been producing lithium for over twenty years, and Galaxy Resources is developing its Sal de Vida lithium project in the eastern part of the salar. In October 2016 and January 2017 (January was a rainy season month), a total of 20 surface geochemical samples were collected under the supervision of Nivaldo Rojas, who is an independent Qualified Person (as defined in National Instrument 43-101). The samples range from 48 to 1,064 mg/L Li and averaged 587 mg/L Li. The average Mg/ Li ratio is 4.63:1. Sample results indicate that the near-surface brines contain high lithium and potassium values with relatively low magnesium values. Surface samples were collected from pits excavated by hand and then drilled to up to 2.4 meters below surface with a manual auger. All assays were analyzed by Alex Stewart Assayers, an ISO certified laboratory located in Mendoza, Argentina. In January 2017, a Controlled Source Audio Magnetotelluric Survey (CSAMT) was completed by Geophysical and Exploration Consultants S.A. of Mendoza, Argentina. CSAMT is a geophysical investigative method for obtaining information about subsurface resistivity. Low resistivity results are interpreted to represent potential lithium brine zones. Two CSAMT lines were run covering the Alba Sabrina, Natalia Maria and Tramo concessions. The E-W line that extends from the Alba Sabrina concession through Natalia Maria and the Tramo concessions is approximately 9,600 meters long. The results for this line show a long, low resistivity anomaly from Natalia Maria to the eastern border of the Tramo concession. There is a 60-70 meter thick upper horizon with low resistivity values that range from 0.2 to 1.3 ohm/meter. The low resistivity zone extends to a depth of at least 250 meters in the Tramo concession, and the anomaly is open at depth. The NE-SW line located on the Alba Sabrina concession is approximately 7,800 meters long. The results for this line indicate the presence of a near-surface, low resistivity layer up to a depth of 60 meters with resistivity values of 0.01 to 10 ohm/meter. Towards the southwest, the low resistivity layer appears to increase to a thickness of 150 to 250 meters. The Salar del Hombre Muerto has been extensively evaluated by both FMC and Galaxy Resources. Galaxy Resources acquired the Sal de Vida project when it merged with Lithium One. 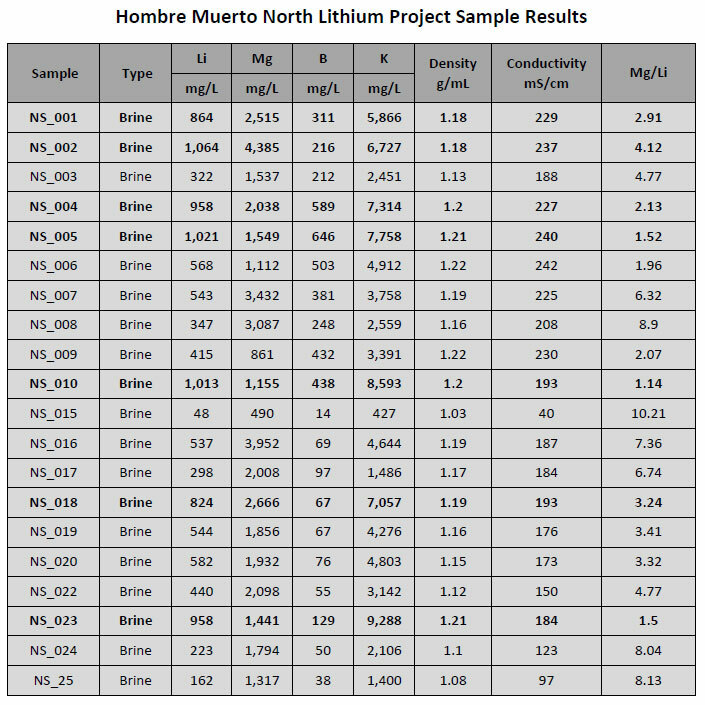 In a 43-101 Technical Report dated March 7, 2012, Lithium One provided a detailed log of diamond drill hole SVH11-21 with assay values that ranged from a low of 564 mg/L Li to a high of 895 mg/L Li over the 95m length of the hole. That hole is located 750 m south of the Tramo concession. In a press release dated April 10, 2017, Galaxy Resources announced the initiation of production-well drilling at Sal de Vida, approximately two km south of the Tramo concession. Given robust exploration, development and mining activity in the area, access to key infrastructure is excellent. Provincial Route 17 passes within 10 km of the project, a 600-megawatt power line between Salta and Mejillones, Chile is 160 km to the north, and a natural gas pipeline connecting mining operations in the Puna region is within 10 km. A railroad line between Salta and the Chilean sea port of Antofagasta that is being reactivated is 100 km north of the Hombre Muerto North property. Company technical management are currently reviewing all available data, and will be providing further details in the immediate future. The project is being acquired through a purchase option agreement from a private borate producer from Salta, Argentina named Jorge Moreno. Mr. Moreno is a well-known businessman in the region, with interests in mining and agriculture. He has been involved in the production and exportation of borates for more than 20 years, and he is also involved in the provision of logistical and mining services for remote projects. In 2016, he was one of the vendors of the Pastos Grandes Project to Millennial Lithium. US $50,000 on signing for a 90-day due diligence period and for the completion of a NI 43-101 Technical Report on the project. The due diligence period may be extended to 120 days, if necessary. Upon acceptance of the NI 43-101 report by the TSX, NRG will pay Mr. Moreno US $100,000 and issue one million common shares of NRG common stock. At that time, Mr. Moreno will join the board of NRG Metals Inc.’s Argentine subsidiary. At six months from Item 2, US $250,000 and one million common shares of NRG. At 12 months from Item 2, US $250,000 and one million common shares of NRG. At 18 months from Item 2, US $1,000,000 and one million common shares of NRG. At 30 months from Item 2, US $1,000,000 and two million common shares of NRG. At 42 months from Item 2, US $1,000,000 and two million common shares of NRG. At 54 months from Item 2, US $2,000,000 and two million common shares of NRG. The project will be subject to a 3% Net Production Royalty, of which 50% may be purchased for US$3,000,000 within 36 months of Item 2. NRG Metals Inc. is an exploration stage company focused on the advancement of lithium projects in Argentina. Company management are highly qualified in the exploration and development to production, of lithium brine projects. In addition to the Hombre Muerto North Lithium Project, the Company is evaluating the 29,000 hectare Carachi Pampa Lithium Project in the province of Catamarca, which is in the final stage of drill permitting. NRG Metals Inc. currently has 66,330,885 shares issued and outstanding, and trades on the TSX Venture Exchange under symbol NGZ, on the OTC QB Market under symbol NRGMF, and on the Frankfurt Stock Exchange under symbol OGPN. The technical and scientific disclosure contained in this press release is approved by Nivaldo Rojas, B.Sc. Mining Engineering (Universidad de Atacama, Copiapo, Chile) of Rojas & Associados, Mining Consultants of Mendoza, Argentina. Mr.Rojas is a Qualified Person as defined under National Instrument 43-101, and is a Fellow of the Australasian Institute of Mining and Metallurgy. He is independent of NRG Metals Inc. and the vendor, Jorge Moreno, within the meaning of Canadian National Instrument 43-101. Mr. Rojas visited the site October 3-5, 2016 when he was contracted by Mr. Moreno to supervise collection of surface geochemical samples. Mr. Rojas supervised the preparation of this press release and approves the scientific and technical disclosure contained herein.